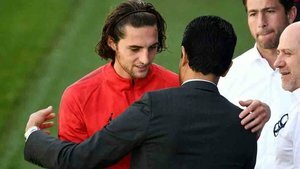 The transfer saga involving Rabiot continues to create more talking points. The PSG midfielder is still training away from the senior squad. Tuchel's team worked in the gym as the training session was cancelled due to heavy snow. In fact it's possible PSG chose to train indoors to avoid a reunion with Rabiot. The midfielder is frustrated at how he's being treated and has already launched an appeal to the disciplinary committee in order to return with the first team. Tuchel was asked about the topic in his latest press conference. "I've spoken about Adrien and his situation a lot. I can only say it's something between him and the club. That's all."